Finally the long awaited for Nut Roast. My lovely patient Michelle recently requested it and I have told so many patients about it, that I finally put the time aside to make it for dinner. It reminded me just how quick and easy it is to make! We have this nut roast every Christmas Eve and make numerous loaves for our group of 20 friends. We like to serve it with a delicious home-made tomato, onion, garlic and basil sauce (and yes, I do actually have it with Magic Dressing too!). Although we like to serve it at Christmas, it is a perfect option for a weeknight vegetarian meal, or even prepared in advance to make a quick lunch option throughout the week. 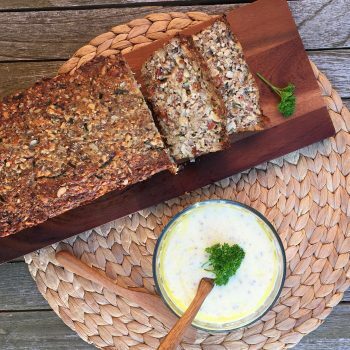 This recipe can be made by hand or you can take short cuts with a blender or a Thermomix. This lovely recipe comes from a wonderful friend Margaret who helps make our Christmas Eve super special. Dice the onion and finely chop the mushrooms. Heat the olive oil in a pan and add the onion, garlic and mushrooms. Fry until soft and leave to cool. Process the nuts in a food processor until finely chopped. Be careful not to chop too finely. In a large bowl, add the cooled mushroom mixture, chopped nuts, cheeses, eggs, chives and breadcrumbs. Mix well and season with salt and pepper to taste. Press into a loaf tin and bake for 45-55 minutes until firm. Leave for 5 minutes and then turn out and serve.